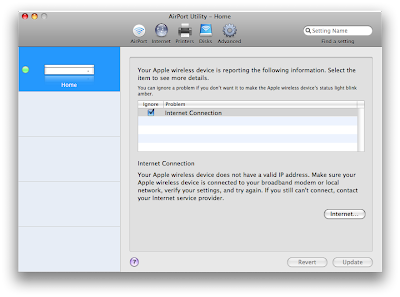 A New Mac Tip Every Day: Blinking yellow light on Airport extreme or express! Blinking yellow light on Airport extreme or express! 1. Click on the yellow light in the status of the manual setup. 2. From there, you can choose to ignore the problem and force the router to display a green light. I usually unplug - then replug it back in - it's a pain but it works. BTW, you can't do this on your iPod Touch, can you? I also have the time capsule but I hate the way it never connects properly! I was wondering if you could post how to set it up! It always has problems connecting to my computer. This tip was not about Time Capsule but just the standard Apple routers and their indicator lights. I will say this if my ISP was so weird that no normal router configuration would work I would certainly look for another provider. After all, Why would they do weird things? What else might they be doing? It can also mean that your airport is not secure. Making mine secure turned the light green. You aren't double NAT-ing are you? If your ISP provides a "gateway modem" and it is providing a DHCP address, then you need to either set it to bridge mode (if it has one) or your airport to bridge mode (this is the method that I must do, since the modem supplied by my ISP does not have the ability with the stock firmware and I don't really want to risk bricking it). If that's the issue, then you can change your indicator light back to the way it should be. The green button in QuickTime!